As the 2017-2018 season winds down, I want to take a moment and reflect on one of the biggest highlights of the year that we experienced just a short couple months ago. When it comes to experimenting with their All-Star Game, I give the NHL a lot of credit for attempting to create interest amongst it's fan base. As I was researching this, I couldn't believe how many formats the league has used throughout the years. The only thing that hasn't changed is every team has at least one representative. Back in the 1940's, the defending Stanley Cup Champions faced All-Stars from the five other teams during The Original Six Era. In 1969, the format was geographic as the NHL went to four divisions with the Wales Conference taking on the Campbell Conference. The first team was voted in by the fans while the remainder of the teams' roster were chosen by the NHL's Hockey Operations Department in consultation with the teams general managers. In the 1980's the Wales Conference faced the Campbell Conference but what changed was the Eastern teams faced the Western squads. The 1990's saw the Skills Competition and the Heroes of Hockey get introduced. In 1994, The Eastern Conference faced the Western Conference. One of the more interesting concepts occurred from 1998-2002 when the North American All-Stars squared off against the World All-Stars. On three occasions, there would be a fantasy format which saw two captains pick teams, and this concept was also utilized in the NFL and NBA. The most recent format change occurred in 2016 with a three-on-three tournament that consisted of four separate All-Star Teams--each representing one of the leagues divisions. There are three separate 20 minute mini-games in a round robin format. Each team has three skaters and a goaltender on the ice. The third period is considered the championship game. Throughout the years, the All-Star Game has been canceled to promote international competition. In 1979, The Challenge Cup saw the NHL All-Stars play the Soviet Union. In 1987, Rendez-vous once again featured the NHL All-Stars play the Soviet Union. Lastly, NHL Players would participate in The Olympics. Who knows what other changes could occur in the coming years. I have actually been to three All-Star Games, two as a writer and out of all of them, there is no doubt the most recent change is the best. My father took me to the NHL All-Star Game at Joe Louis Arena which featured "Mr. Hockey" Gordie Howe in 1980. Seeing the Skills Competition in person impressed me of the athletic ability of hockey players. During this story, we spoke to many people not only at the game, but when the Detroit Red Wings visited the Florida Panthers on February 3, 2018, to get their opinions on the three skaters and one goaltender format. Before talking to players, I asked Commissioner Gary Bettman whether he foresees participation in the Olympics. "The fact is we find, the clubs find, the owners find that the Olympics are very disruptive on our season, and for that and a whole host of reasons we've been over repeatedly over the last year or so, it didn't make sense for us to attend. Could that circumstance change at some point in the future? I suppose so. But it's not something that we're currently contemplating." From a management standpoint, there is no better person to speak to other than Detroit Red Wings Senior Vice President and Alternate Governor Jim Devellano. Devellano is in his 36th season with the Red Wings and has been in the NHL for 51 years. His tenure with the Red Wings makes him the longest serving hockey employee in the history of the team. "I think it's very good in an All-Star Game because you have the world's best players and they're all skilled. When you get them open ice like that, they're going to put on a great display, stick handling, scoring and skating. "The other good thing about it is, you hate to have players hurt in an All-Star Game, and with the open ice, and fewer players, there is less chance of injuries. I think it's good all-around." What does Devellano think of other formats and is this the best one? "It is because it got to the point where the players didn't really try very hard. They didn't want to get hurt, hurt other players, so they played soft. But with the three-on-three, there isn't a lot of body checking and it's all skill. So I think it worked out to be a good format." Here is what some current players had to say about the current format. Forward Josh Bailey, New York Islanders, formerly Windsor Spitfires. "I like it. It's good for the All-Star Game, good for the fans to really see the skill and speed. You could see before with the four-on-four, five-on-five, obviously no one wants to get hurt out there, no one wants to run around and hit people. It's a good way to kind of meet in the middle to see the talent of what the league has to offer. So I think it's a good format." Defenseman Alex Pietrangelo, St. Louis Blues. "I think it's fun. Part of the All-Star Game is to showcase the skills of the players. I'm sitting on the bench and I'm like it's hard to score goals. You realize how good these goalies are right. It's just the shot or it's a breakaway. Boy, you realize how hard it is to score. It's good. Not only good for us, but to showcase how good the reserves are." Forward Rickard Rakell, Anaheim Ducks. His Pacific Division defeated the Atlantic Division 5-2 in the Finals. "I really had a good time and it was fun winning the whole event. I really enjoyed the three-on-three format. After the first game, it was slow paced, but it was nice to pull through." Forward Aleksander Barkov, Florida Panthers said it was awesome to play in his first All-Star Game and provided interesting perspectives about the regular reason. "In real games, you have to defend even harder than you do in these games. But still, you get tired when you run around those guys like (Edmonton Oilers, Connor) McDavid, (Calgary Flames, Johnny) Gaudreau and guys like that. If you lose the side of them, they'll make you pay. Three-on-three is fun to play when you have the puck, but when you don't have the puck, it's not fun." Goaltender Carey Price, Montreal Canadiens. "I think it's much better personally. I think the flow of the game is a little bit better because there aren't so many guys standing around. The guys are skating more and there is more room out there. It kind of open things up a little bit, guys not standing still as much. There is more skating room and as a goaltender, it's nice I can play with the puck to get a couple touches in and get an assist or two." The two former players I spoke to were from the Florida Panthers and Detroit Red Wings at the BB&T Center in Sunrise, FL. I'm speaking of Bill Lindsay and Paul Woods of the Red Wings. Lindsay played in the NHL for 14-years and was a member of the 1996 Panthers Eastern Conference Championship team. He's in his third year as the radio color analyst, and previously spent six seasons as a team television analyst, after spending two years as the club's radio color commentator. Lindsay has played in more than 750 NHL contests. So he's seen plenty of hockey. Like everyone in this story, he was impressed with the three skaters and goaltender format. "It's exciting. I think the players like it and the fans. The All-Star Week you want a celebration and you want a bit of competition. They're playing for some money so that puts a little bit of an edge into it. "Plus, the three-on-three can show the skill that's in this league. The NHL in my opinion has never had more skill or talent than it has now. There is no better way to showcase it than with the three-on-three. It's absolutely fabulous. It's a great way to showcase the premier players and show how legitimately talented our athletes are. 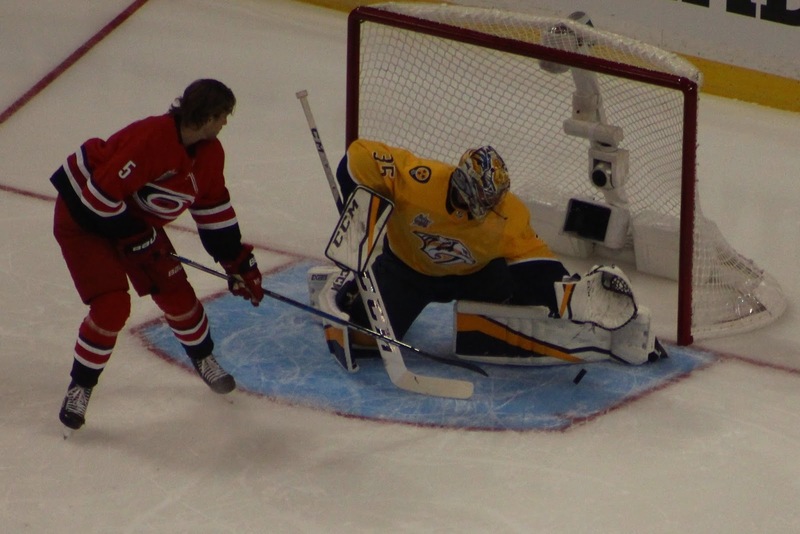 "I'm not sure the goaltenders love the three-on-three. But you can get exposed. This kind of stuff is magical. The way the players can do it now with this kind of hockey at the pace at which it's played is fun to watch." Detroit Red Wings General Manager Ken Holland was an advocate for the three-on-three to be played in the regular season in overtime to replace four-on-four. The NHL took Holland's recommendation and added it to the All-Star Game which has worked so well with the excitement level drastically increasing. Woods is another player that has seen a lot of hockey. He played seven seasons with Detroit from 1977-1984 and his career was cut short because of a hip injury. He has been a radio analyst since the late 1980's. Woods, 62, is one of the nicest people you'll ever meet and he's quite colorful. He definitely enjoys the three-on-three format. "I like it for sure. It's way better than the five-on-five. In the five-on-five, sometimes in games like that, you can hide a little bit. In three-on-three hockey, you're naked out there. You just have to keep up all the time, offensively, defensively otherwise you let your team down. It's a much better format. Again, players get to show their skill more in three-on-three so it's a good idea for the NHL." When I asked Woods what he thought about the NHL changing formats through the years, he responded, "The thing I like about this is it becomes real competitive because they have some money on the line. So each team or each guy on the winning team can make a $100,000 so there is a reason why to win those hockey games. So it's important and again back to the three-on-three, and the skills competition, there are a lot of good ideas. "The NHL is a well run league and have made a lot of good decisions on going back to setting the salary cap. They just keep getting better and better, and the All-Star Game is an example of that." Woods was gleaming about the skills competition and even had some ideas on how to make it better. "To watch the players in the games all the time, they can't use all those skills. 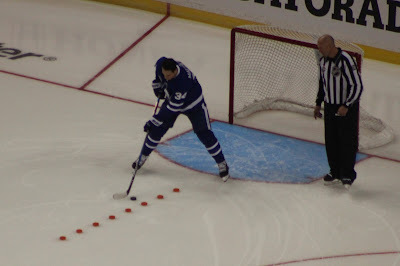 But when you do see the guys and what they can actually do with the puck, with a stick in practice, it's amazing the hand and eye coordination that NHL players have. "The one thing I would like to see in the fastest skater competition is an actual race. Instead of having a timed race, one guy skating one way, the other guy going the other way, I would like to see a two lap race. The fastest guy around and manage those turns. "Connor McDavid is a very fast guy, but we have two with Dylan Larkin and Andreas Athanasiou. It would be a very exciting format for the fans." It remains to be seen if the NHL continues to make more changes to make the All-Star Game more entertaining. But I do agree with Woods that fastest skaters competition would be a great change. When you think of horse and auto racing, track and field, there is nothing like a competition with combative speed. I give the league a tremendous amount of credit for trying many things until we've reached this point. The other major sports have also made changes based on poor ratings, lack of intensity, and at one point the NFL nearly eliminated the Pro Bowl. After this experience in Tampa Bay, watching the skills competition, it's easier to gain a deeper appreciation of the talent these players do possess. I look forward to returning to another one when the situation presents itself, but will enjoy it more when I watch it on TV as well. It will be interesting to see with the Red Wings influx of young, athletic, skilled speedsters which ones will appear in the NHL's mid-season big stage. The Red Wings have been stockpiling draft choices for the next two seasons, so it will be interesting to see what new talent they acquire as the organizational skill level improves. Scott Morganroth can be reached at www.scottsports33.com and is a member of Detroit Sports Media. Candy Ebling also contributed to this story. 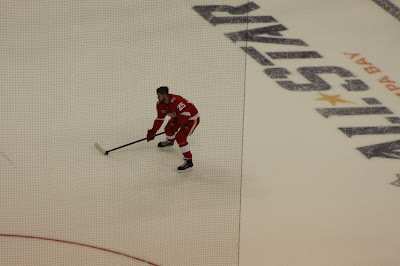 During NHL All-Star Weekend in Tampa Bay from January 27-28, Detroit Red Wings Defenseman Mike Green found himself answering a lot of questions about where he could find himself at the trade deadline at the end of February. Would he be happy to return to the Washington Capitals? Green politely answered every question in a 25 minute media session. But one thing remained consistent during his questioning. He kept telling the media how much he enjoyed playing for the Detroit Red Wings and really never wanted to leave. Green does have a full trade clause in his contract and would later indicate that the only teams he would waive it for were the Capitals and Tampa Bay Lightning. But there was one major thing which prevented a possible trade. Green sustained an upper body injury which caused him to miss games, therefore, teams wouldn't trade picks for an unrestricted free agent rental which could be damaged goods. Red Wings GM Ken Holland still managed to trade Goaltender Petr Mrazek and Forward Tomas Tatar as he stockpiled draft choices for the next two seasons. During Green's Press Conference, I did manage to slip in some questions as he provided some insightful thoughts about different subjects. Q: Do you relish the opportunity that you can be a veteran player to mentor and teach a lot of these kids since you've been a Red Wing? A: I just think it's a matter of understanding the game. I don't think you can teach these guys much because they're so skilled and talented. My approach is getting them to understand how to be consistent. To be honest, I've learned a lot from them too. This next generation of young guys is incredibly talented, incredibly focused and it's great to see. Q: The one thing I've noticed with these young guys is they play with an incredible amount of energy. Do you draw from that energy? A: It's definitely helped me. It's caused me to change my workout routines and approach because these guys are so fast now that I have to keep up. But playing with guys like Dylan Larkin create so much energy the way he skates, moves the puck up the ice, along with Andreas Athanasiou, Anthony Mantha and some of the other kids coming up. So it does create a lot of energy. I think that's what's exciting about Detroit is that they have a lot of the great energy young players coming up and will be good. Q: In the new NHL, enforcers are not as common but the Red Wings have one in Luke Witkowski. When he does play, how would you describe what he's meant to the Red Wings this year? A: I think immeasurably. At times, when we come out and have played with high energy, it's because Luke's in the line-up. He creates that sort of energy for us when he is there. Not only that, he's an utterly great teammate and player. It's been a pleasure playing with him so far. Q: When you look at the banners in the rafters and all the great players who have played for Detroit, and the town itself, how does it feel to be playing in "Hockeytown" compared to other cities? A: I don't know if you can compare it when you're with an "Original Six" team. Obviously, I've played on a different team. You can't compare it with Detroit. Walking in the dressing room, all the pictures of all these old players, captains, and obviously the amount of Stanley Cups they've won on the walls. It's pretty special. You have to take a moment to kind of respect and appreciate what that organization has done. Q: Tell me what it's like to play in Little Caesars Arena (LCA) and give me your thoughts about Joe Louis Arena? A: It's been great. The facility is incredible. We're fortunate as players that we have this incredible work out facility and spoiled in that sense. Comparing to "The Joe," it's different and interesting starting the season at LCA. We wondered what kind of energy it would bring knowing what Joe Louis had and represented, which with it's history in itself and you could feel it. It's about creating the energy now here at Little Caesars Arena and building a legacy there. Q: Do you know much about the old Olympia Stadium? A: I respect it because when I first got to Detroit, I read this book on the history of all the buildings, and the history of the Olympia building at the time was creative and was pretty cool. When you're in Detroit, it's a pretty incredible city and what's transpired over a long period of time. Whether the 32-year Green gets a contract remains to be seen. He definitely does embrace the history of Detroit Red Wings Hockey. Anybody that researches previous stadiums comes across as a traditionalist which is tough to find nowadays. When you're rebuilding, it's vital to have veterans to provide a positive influence on the younger players that demonstrate leadership, plus lead by example. But as we stand right now, The Trade That Wasn't Made could pay dividends in the immediate and foreseeable future.